Armidale Regional Councillor Jon Galletly, left, Armidale Urban Rivercare Chairman Bruce Whan, South New England Landcare Co-ordinator Sara Schmude, Northern Tablelands MP Adam Marshall, Mayor Simon Murray and Riovercare Co-ordinator Bryan Johnston celebrating the funding news at the Armidale Creeklands last Friday. NORTHERN Tablelands MP Adam Marshall says a $25,000 State Government grant for Southern New England Landcare will give Armidale’s Urban Rivercare Group the ammunition to mount a greener, safer and more sustainable steam spray system to kill weeds across the district. Mr Marshall has announced the funding for the Urban Rivercare arm of the Landcare group last Friday and said the new trailer mounted weeder would better wage the war on weeds in areas where the public has access and in other environmental plots. “The beauty of this new steam weeder is that it gives us a chemical-free arm to fight weeds in high profile public areas, so that will allay any safety concerns in the community about using traditional weed killers,” Mr Marshall said. Armidale Urban Rivercare Chairman Bruce Whan said the unit was a trailer-mounted weeder with a diesel boiler that processed high volumes of steam. “It creates steam at 140 degrees and you spray it onto the plants so it basically desiccates it, so it boils it essentially and kills them,” Mr Whan said. Mr Marshall said traditional methods like Roundup involved meticulous spraying regimes, to counter any spray drift, but the new steam weeder had no issues in that regard. “It’s quite a versatile unit, it’s basically mounted on a trailer and it can be towed by a ute or an ordinary 4WD vehicle,” Mr Marshall said. Mr Whan said Southern New England Landcare was extremely grateful for the grant and the support of Mr Marshall in helping secure it. He expects the unit to be on deck later this month, and with some training for those who will drive it, ready to attack weeds soon after then. Mr Marshall said Landcare was a movement as much about community as it is about environment, and governments needed to support the viability of both. 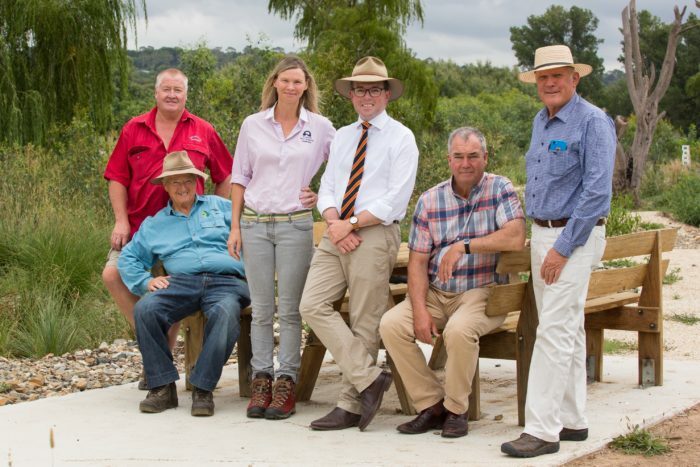 “Landcare has evolved to be a highly diverse, community-based, hands-on environmental action that represents a terrific investment for government money,” Mr Marshall said.